Tom and I drove to Humeston,, Iowa to pick up CHAR, and bring her home. We decided on her because of one dog in particular that was in her pedigree. We had been watching other dogs sired by her father, and we were quite impressed with their style in the field. After many phone calls we were able to locate a breeder that had a breeding with the bloodline. She was quite the package, because not only was she out of the dog we were so impressed with, but she also carried the blood of some of the greatest Field Trial dogs ever. CHAR was quite a character. She always seemed to want to get the last word, or should I say bark in, and when she did something incorrectly she was like the little kid that did something wrong and he did it in such a fashion that you had to laugh even though you knew you shouldn’t. Due to the quality of dogs that she was out of she was what most would refer to as HIGH MAINTAINENCE. You definitely had to be on your toes with her and make sure that the obedience was constantly turned on. 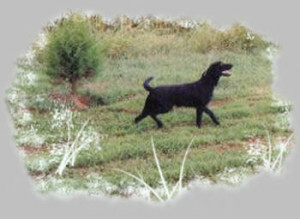 She was so full of explosive energy that her training was stressed more on the obedience than the retrieving. She returned from a retrieve as hard as she ran out and if you wasn’t careful she’d knock you over when she returned and jumped to spin into heel position. CHAR was not a hard dog to control but you did have to put emphasis on that area of her training just so she would remember who was in control. She was a very hard driven and strong willed dog and it was quite impressive to watch her run no matter whether you were the one working her, or on the side lines as a spectator. The energy, and style, she possessed was quite impressive and definitely deserves to be remembered.